What can you do to prepare your students to present the Amman Imman project to your community? Tie the project into the curriculum Here are a few ideas, and there are many more possibilities! As you study the water cycle, relate that throughout the Azawak the water table is at least 600 feet below the surface, too deep for regular well-digging. In your study of simple machines, note that the deep open wells in the Azawak utilize a pulley system. 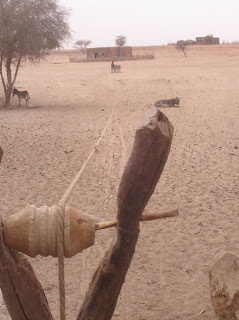 However, with the depth of the wells at 300 feet and deeper, the people cannot not power the pulleys themselves but need the assistance of donkeys who often collapse in the process. Research the global water crisis, learn about nomadic cultures, discuss political and environmental implications that affect the people in the Azawak and why they do not have the resources they need. United Nations Classroom Resource Guide on Water, designed to inform students about the world's water resources and get them involved in preserving them. 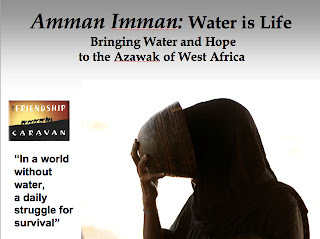 To learn about the Amman Imman project in the Azawak, spend some time familiarizing yourself with the Amman Imman website where you can find valuable information about the people of the Azawak, water insufficiency in the region, and Amman Imman's project to build boreholes as a sustainable solution to the water scarcity. This 38 minute movie features footage from the Azawak. In it, Ariane tells the story of why she started the project and describes the circumstances under which the children and families live with a daily trek in search of water. Please bear in mind that this video was made in January, 2007 and so does not include information about Amman Imman's installation of the borehole at Tangarwashane. The powerpoint presentation, together with the script, contains up-to-date and detailed information about the project, including photos of the completed borehole at Tangarwashane. Download it at a .ppt file through scribd.com. Once you learn about the project and review the script, you will want to tailor it to your audience. It contains many details and may need to be simplified depending upon the age of presenters. Presentation for Elementary Students: Download this file for your students to present the project to other students ages 8 -12. Presentation for MS Students: Download this file for your students to present to Middle School and older audiences. Tell why this project is important to you. Add slides to the powerpoint presentation to show what other schools have done and how your school plans to raise awareness and funds. Remember to speak slowly and connect with your audience by making eye contact. Before making the presentation to your community, practice in front of a small audience. I have found that people are truly moved by hearing about the Amman Imman project. 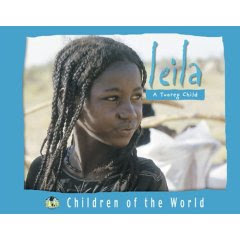 Not only are they touched by the plight of the people in the Azawak and therefore want to help, but they are inspired by the efforts of children actively working to tell the world about this crisis.